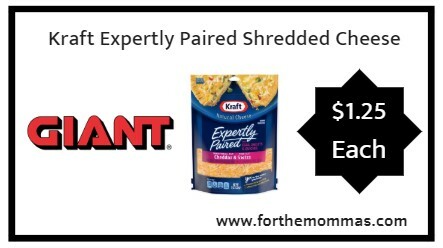 Giant: Kraft Expertly Paired Shredded Cheese Just $1.25 Each Thru 10/25! Thru 10/25, Giant will have Kraft Expertly Paired Shredded cheese for $2.00. Submit for a ibotta rebate to make the final price $1.25 each. ShopRite: FREE Santa Cruz Organic Drink Thru 4/27!